Flowerfeldt® choses the best partners in courier services. The courier services we offer at Flowerfeldt® are therefore simple and fast. Of course we only work with the best shipping partners available. 1. What countries does Flowerfeldt® serve? 2. Can I also place an order outside of The Netherlands? 3. Does Flowerfeldt® also serve other countries besides the EU? 4. Are there different shipment rates? * The above mentioned tariffs may differ, because this is depending on the offered/ purchased item(s). We will get in touch with you when this is the case. Of course we will persue the most convinient shipment solution for you. 5. What shipment options can I choose from? 6. What is the difference between courier and Same-Day-Delivery? 7. I want to choose the option Same-Day-Delivery. What do I have to take into account? Same-Day-Delivery stands for ordering and receiving your order the same day. This option at Flowerfeldt® is available to you on Mondays to Fridays and Saturdays. Do you want to receive your order the same day? Than its important to order before 12:00AM. The courier will deliver your order between 06:00AM and 10:00PM. 8. Do I always pay a set and low tariff at Flowerfeldt®? We don’t like hidden costs. Regardless of the amount of products, you will pay a set and low tariff. We will cover the costs in the event of multiple shipments (due to temporal unavailability). The tariffs are valid for The Netherlands, with exception of the Waddeneilanden (NL). 9. Can I follow the status of my order? An email will be send to you with all information you need for Tracking & Tracing your shipment status. That way you will never encounter unpleasant surprises. 10. What shipping partners does Flowerfeldt® select to do business with? The preferred suppliers of Flowerfeldt® are: UPS and PostNL. 11. Please help! I need my order with great urge. What to do? Are the shipping options not suitable for you? Then please get in contact with our customer service department. We would like to participate in finding the most convenient solution for you. Please take notice of the fact that it may implicate higher shipment costs. 12. Do you also deliver on Sundays and holidays? THE BEST PACKAGE. MOST CAREFULL. 13. How does Flowerfeldt® ship the flowers and bouquets? Flowers and plants we provide are fresher than fresh. Flowerfeldt® buys directly from the nurseries. 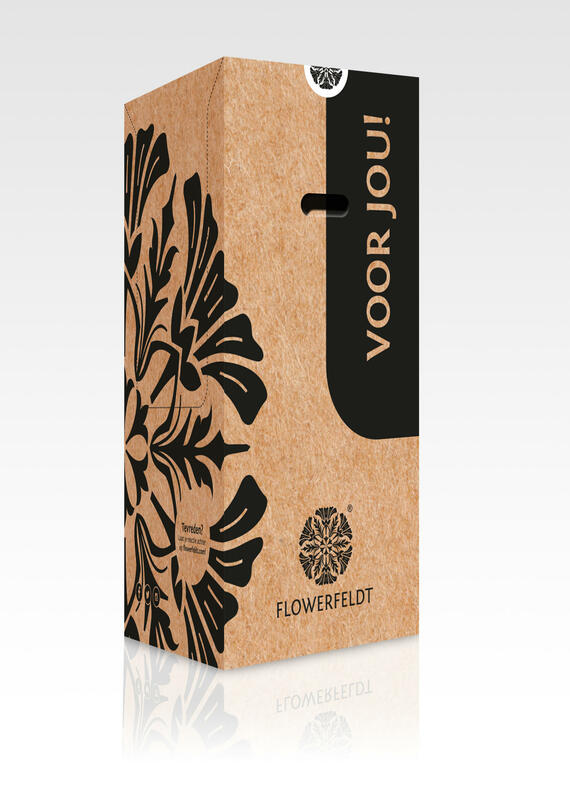 Therefore, the flowers and plants from Flowerfeldt® stay fresh for a longer period of time. On top of that, our products are quality checked by hand. Do the products meet all the quality standards of Flowerfeldt®? Only then we will process your order and made ready for shipment. We have developed a special box for shipment purposes. As a starting point: to protect your products optimally. 14. A special shipping box? What do you mean by that? The Flowerfeldt® shipping box is made from extra sturdy cardboard. You will notice the difference immediately when you receive your package! We have deliberately chosen the best quality available. The Flowerfeldt® shipping box has the FSC-mark on it. This gives you assurance that this paper comes from responsibly managed forests. Our shipping box has been tested extensively in the last months and found to be vandal-proof. The Flowerfeldt® shipping box and contents can withstand a (considerable) beating! The bouquets of Flowerfeldt® are provided with water during shipment. In order to make this happen, we use a unique (shipment) vase. This special vase provides water during three days. The Flowerfeldt® bouquets will be provided more than enough water for three (shipment) days, even on very hot days (>34º C). 15. I have ordered a vase and bouquet at Flowerfeldt®. Why have I received two shipping boxes? Simply because we find combined shipments (read: bouquet and vase or plant and design pot) not justified. Combined shipments are the cheapest solution for our company, but Flowerfeldt® stands for uncompromising quality. Combined shipments can enhance the chance of damaged goods. We want to minimalize this risk. Nothing is more disappointing than receiving a damaged vase or bouquet. RETURN OR COMPLAINT? TOGETHER WE WILL FIND THE BEST SOLUTION. 16. Can I return flowers, bouquets or plants? Return or exchange of fresh products is not possible. We hope you understand why these products can’t be returned. 17. I want to return a product other than mentioned in question 16! No problem at all. You can return these products within 14 days after you have received your order. Of course in original condition, undamaged and in the original packaging (when reasonably possible). 18. I want to return the product. What do I have to do? Step 3. Please describe clearly why you want to return the product. Step 4. You will receive an email from Flowerfeldt® with instructions within 24 hours. 19. How soon will I get refunded after return of the product? We will refund within 14 days after you have indicated your decision to cancel your purchase. I case we have received the undamaged product earlier? Then there is a good chance that we will refund you sooner. 20. Can I exchange a product at Flowerfeldt®? Exchange of products is not possible. 21. My order has been damaged during shipment. What to do? How annoying! Please let us know instantly via info@flowerfeldt.com. Do not forget to enclose some pictures from the damaged product. We will get in contact with you within 24 hours to provide a suitable solution. 22. I haven’t received my Flowerfeldt® order yet. The timeframe of delivery might be shifted. Have you submitted the information correctly? Because maybe the delivery address has been submitted incorrectly. Did you receive a “not home” message? Possibly your package has been delivered at your neighbours or the courier has planned a new moment of delivery. Are you still awaiting your order? In that case, please get in contact with us.